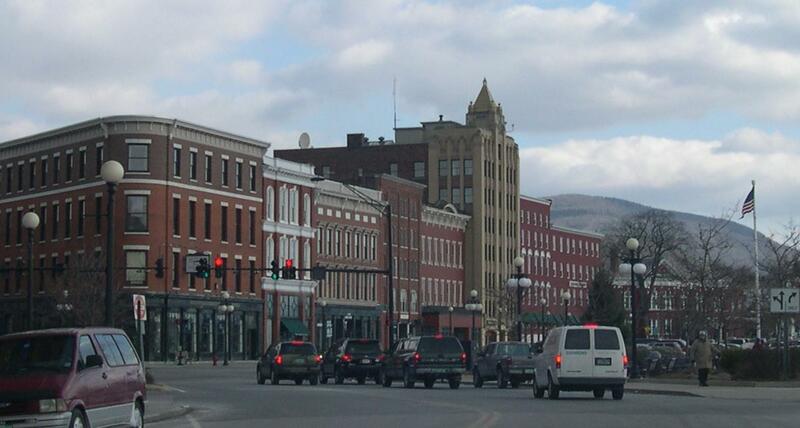 Is Rutland, Vermont embarrassed to be itself? Being a native of that area of Vermont, the place has long had an inferiority complex. I swear to some people, admitting you’re from Rutland is like admitting to enjoying dead, rotting skunks as midday snacks. The latest incarnation of this Rutland embarassment was an advertisement I heard for a June 25 concert by Pat Benatar and REO Speedwagon. The ad kept saying the concert would be at the “Vermont State Fairgrounds” but the pitch never said where said fairgrounds is. Well, it’s in Rutland. Since the ad never says it’s in Rutland, I guess the implication is if Pat Benatar is playing in Rutland, she must have hit rock bottom. Sure, Rutland is a step down from the arenas Benatar filled in the 1980s. But there’s nothing wrong with Rutland or the Vermont State Fairgrounds. Benatar should be, maybe not proud, but fine with performing there. It will be a great show. I”m an out and proud Rutlander. West Rutlander, actually. Better known as a stone pegger. People from West Rutland are called stone peggers. Probably a legacy of labor riots there in the 1920 and 1930s. So the town’s a little rough and tumble. I don’t live around Rutland anymore, but I’ve always had a soft spot in my heart for the area. The Rutland area’s own inferiority complex gets in the way of its own success. The city’s got a charming little downtown, but nobody sees it because the main drag through town is Route 7. Route 7 in Rutland has got to be the second ugliest patch of real estate in Vermont. It’s several miles of gas stations, fast food joints, mini-strip malls, run-down bars and houses, and vacant lots, all lining a confusing, traffic jammed highway. Picture a mini version of the New Jersey turnpike, without the charm. Only a couple tiny little signs point the way to the much more pleasant downtown. I said Route 7 is the second ugliest stretch of road in Vermont. The ugliest is Route 4A between Rutland and West Rutland. A major landowner has let all his buildings literally collapse along the stretch of Route 4. Visitors enjoy the view of a neighborhood that looks like it was hit by a tornado five years ago, and then left untouched since. True, a lot of things don’t change around Rutland. A house on Route 7 burned when I was six years old and the the wreckage of the fire-ravaged home stood until a couple years ago, when I was 46. That’s four decades of somebody not dealing with a burned out house. 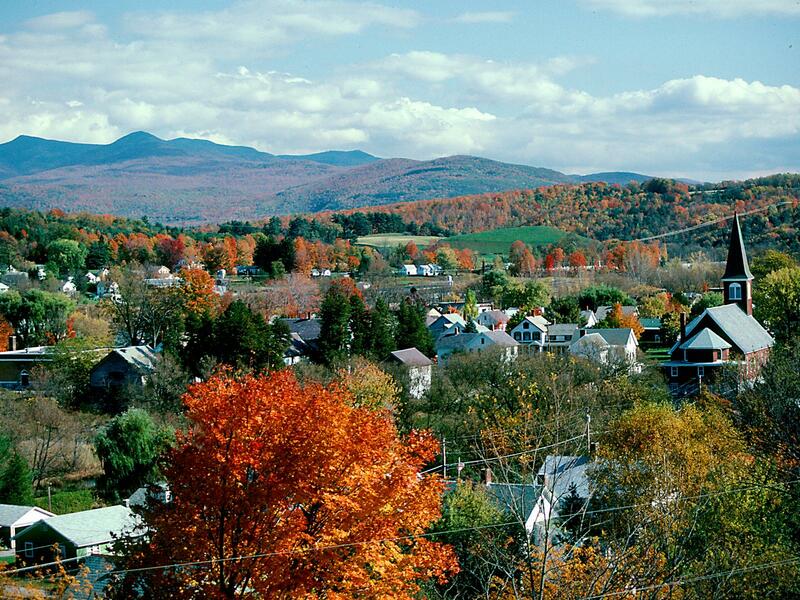 A pretty autumn view of West Rutland, Vermont. In West Rutland, there’s a neighborhood everybody still calls “The New Development” All the houses in “The New Development” were built in the 1960s. See, it’s as exciting, dramatic and brightly lit as Las Vegas, Nevada. The quiet, however, is much of what I like about Rutland. The landscape is pretty, there’s lots of outdoor recreation and the pace is a welcome break from the rest of the frantic world.The next time you say “World, Stop! I want to get off this merry-go-round, just go to Rutland. There are glimmers of hope people will overcome the Rutland inferiority complex and admit its a nice place. A documentary film called “The Blood in This Town” is coming out this fall. It’s about how people in Rutland organized New England’s biggest blood drawing ever. It was a great community project, and people had the feeling underdog Rutland won that round. There’s also a group called Rutland Creative Economy, which is trying to tease out the region’s strengths and build on them, to make the Rutland region something to talk about, and more. I know this blog post sounds like an obnoxious Chamber of Commerce sales pitch. But I always cheer for the underdog. Especially when the underdog is something like Rutland, a place that at first glance is nothing special, but if you dig a little bit, you find lots of treasures. This entry was posted on June 2, 2010 at 3:14 pm and is filed under Uncategorized. You can follow any responses to this entry through the RSS 2.0 feed. You can leave a response, or trackback from your own site.